The events in our country of the past several weeks have been very distressing. I’m not smart enough to know the truth with regards to Ferguson, MO or New York City, so I’m not even going to attempt to weigh in either way. What I’m going to focus on today, though, are the words of Our Lord and Savior, Jesus Christ, as He relayed to us in Revelation 3:20. The problem, as I see it, is that for far to many of us, the wrong person is knocking, and we are letting the evil one in more and more often each day. It is extremely important to me that I try and make my point to you that Jesus knocks on the doors of our lives every day, wanting to be let into our hearts. Is your heart receptive to Him? Do you hear His knock? Or, have you already opened the door to the evil one? 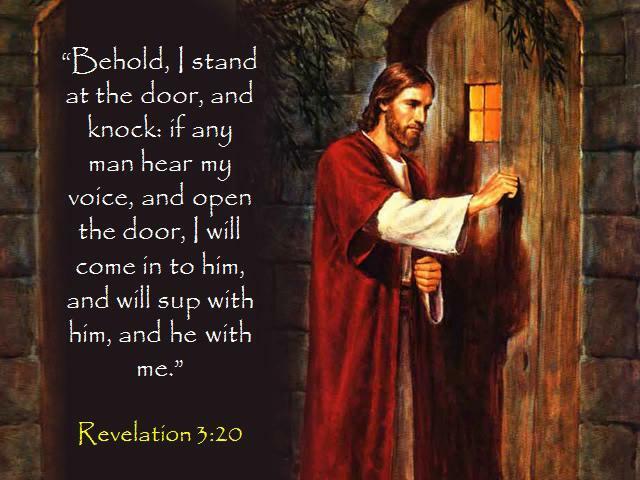 If you are like me, you have opened the door to Jesus’ knock, and you have let Him in. However, I know also that I have answered the door when someone other than Jesus has knocked also — and I have let the wrong person in far too often. It is such a simple prayer, but it packs quite a punch. By making yourself a blessing to someone each and every day, you are showing that the love of Jesus resides right in your heart. Now, please read and pray for our prayer requests and praises. Thanks everyone for doing so each and every week! I have a prayer request for my friend Melissa. Here is what she wrote on Facebook:I have never met a dog who could charm anyone quite like Lucy could. Sadly, last night Lucy left us. We got 18 extra amazing months with her after her original osteosarcoma diagnosis. This beautiful girl was courageous, loving, and strong. She left us with Eliza, myself, and her oncologist all wrapped around her in hugs telling her how much we love her. An entire medical practice took time yesterday to come into the room to spend time with her, give her treats and say goodbye. She touched a lot of lives, and none more than mine. She has been my companion, my snuggle bug (she insists on being the inside spoon), and my confidante for almost 6 years to the day. She listened to me cry, she nuzzled against me and she always tried to make me feel better. Please say a quick prayer for our family and our beloved Lucy – we will see her again at the Rainbow Bridge. And until then, Run free sweet pooch. My friend Pam has a prayer request. Here is what she wrote on Facebook:FB friends please keep Ronnie in your prayers as he has surgery in the morning. Thank you as always from both of us! One of my good friends, Wendy, is in need of prayers. Here is what she wrote on Facebook:PRAYERS PLEASE::: Dear friends, I’m not one to put every personal detail on FB so please forgive the vagueness of this post… But I do believe in Facebook when it comes to the power of prayer, and our family is in GREAT need of it right now for this amazing little guy, Owen. PLEASE join us in lifting him up in prayer for the next several days. Thank you all!!!! (BTW in case you can’t tell in this picture, he is showing off his firetruck shoes! )Please pray with me:Heavenly Father, Your Servant Wendy needs prayers for her little guy, Owen. We don’t know the details, and we know that we don’t need to know them, that You know exactly what is wrong, and that You will take care of it. Please be with your Servant Wendy and her family, and take care of everything that Owen needs. We ask these things in the wonderful name of Your Son Jesus with thanksgiving this and every day. Amen! Praying for my friend Maria and her family tonight — here is what she wrote on Facebook:Feeling the loss of my dear mother-in-law, Eleanor Lundberg Milnes, who passed away yesterday. She welcomed me into her family 42 years ago and always treated me like another daughter. We were blessed to have her for 93 years. She will be greatly missed, but I have no doubt that she’s organizing an amazing choir in Heaven, and singing like a true angel. Love you, Mom!Please pray for Maria and her family, but also give Praise to God for His Servant Eleanor. December 7th is my Uncle Phil’s birthday — unfortunately, we lost him far too early. On this day, I ask you to remember the wonderful legacy Uncle Phil left behind — his wonderful wife, my Aunt Claire, and their three wonderful daughters, my cousins Cathy, Ann, and Beth.Ladies, I’m remembering you all, and Uncle Phil also, giving Praise to God for his life, and the wonderful women that you all are. I love you all. December 7th is also the 73rd anniversary of the attack on Pearl Harbor. That is so long ago that many of us that know of that date didn’t experience it, and only know about it from the history books. Please remember, though, the sacrifices that our ancestors went through so that we can enjoy the freedoms that we have today, and never forget. Prayers for the Week – Worship in Spirit and Truth! Please say a prayer for my family. We have buried three loved ones in the last week and half. We just got news that an Amazing Aunt is in the hospital after attending my grandma’s funeral. She is currently in Chattanooga and has fluid on her lungs and her liver plus additional complications. She was in the hospital a few days ago and they took off 2 liters of fluid off her stomach and her lungs. Her kidneys are functioning at 23%. Thank you in advance. Previous Post: Walt Disney’s Birthday!